Trick training your horse can be a fun way to engage your horse’s mind, expand his reasoning capability, and strengthen your bond with him. It is also very fun to show off your horse’s new talents to family and friends! There are so many tricks to choose from. You can teach your horse to bow, count, smile, give a kiss, pick up an object, shake his head 'yes’ or ‘no’ or retrieve an object. The possibilities for trick horse training are endless! Think of all the things you have seen horses do in the movies. They rear, come running when called, and fall over. Those are very highly trained trick horses! Why Should I Try Trick Horse Training? I mentioned earlier that trick training for horses can expand his reasoning capability. 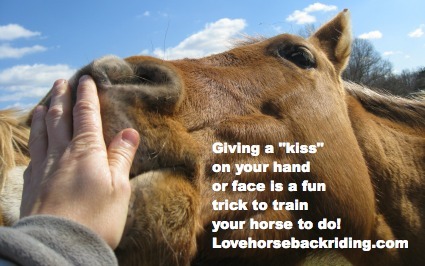 Let’s look at this principle a bit closer to see why you would want to start trick training your horse. The horse is a prey animal. His first instinct is to run from danger. Horses run first and then think later. This has allowed them to survive over thousands of years. In a modern world and with people this instinct can get him into trouble. Teaching him to think his way through things is the best training you'll do. Trick training your horse causes him to think first, then act. It teaches him to look to you for direction and leadership. Teaching him to think his way through things and look to you when in doubt is the best training to do. As you teach the horse tricks you reward the effort he puts into the right response. When he gets a reward for trying to get the right answer, he will try harder to figure out what you want. Over time, he will want to please you and get the right “answer.” Then he will try new things. He becomes an active participant in his learning, and will be looking to you for praise and the “right” answer. Training Horses To Do Tricks- How Can I Teach Them? It takes repetition, consistency, and releasing at the right time to gain success when trick training your horse. In the beginning, you will need to reward any positive try he gives you. Later as he becomes more confident with the behavior, you can ask for more. Patience, repetition, and a good sense of humor are key here. If you get frustrated or angry about trick training your horse it won’t work. He will just feel your frustration. Horses are SO good at reading all our emotions. Make sure you keep your sessions short and limit them to one trick at a time, especially in the beginning. Asking for too many things or too much too soon will confuse and discourage your horse. 5-15 minutes per session is plenty. Remember, young horses are like small children. They have short attention spans so stick to the 5 minute side. Horses 6 years and over generally have a longer attention span and depending on your horse’s personality and motivation level you could lean towards the 15 minute side. Clicker training has become very popular, especially for teaching tricks because you quickly reward a highly targeted behavior. This builds the horse’s confidence in learning the trick quickly. You can read more about how clicker training works at my clicker training for horses page. 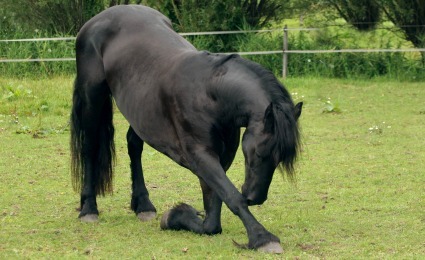 If you want to teach your horse to bow you can start by teaching him to reach his nose down between his front legs. You can use a treat such as a carrot in your hand. Put it between his front legs towards his nose. 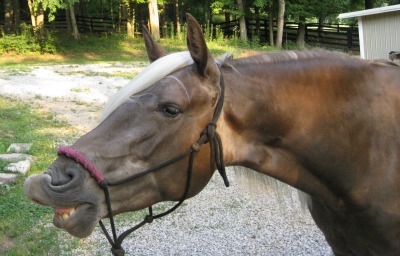 Most horses will naturally lean down towards the treat to get it. Don't ask him to go too far the first several times. Reward often. As he gets better at finding the treat move it farther away so he has to stretch further to get it. Combine the treat with either a verbal cue such as “take a bow” or a tap somewhere on the chest or shoulder, or both. If you pick a physical cue such as a tap, use the same place and tap every time. Use voice commands consistently. Use repetition rewarding him with the treat or praise when he does what you ask. As he gets better he will recognize the voice command or tap and do the bow. If you want a full down on the knee bow you will have to gain your horse’s trust to where he feels comfortable enough with you to go into that vulnerable position. This will take trust and time to develop. Don't use a rope around his leg unless you are certain he will understand it and not panic. You should never force your horse down onto one knee as this will frighten him and it will hurt your training efforts. Some horses become very eager to get the treat! When trick training your horse make sure that YOU are in control of the treats. You don't want him “mugging” you all the time. He will need to stay respectful of your space. Give the treat only when he is attentive and respectful. If he is too eager and your fingers are in danger, you will need to find something else to motivate him such as rest or scratches. should be done very cautiously. Teaching these can be physically dangerous for you. If you don't have a strong relationship with your horse he could use these tricks when you don't want him to. If you sell your horse it could be dangerous to someone else. If your horse has a tendency to offer a trick without you asking, you should be especially cautious. If you sell your horse, make sure you are very clear with his new owner about what tricks you have taught and what each cue is. That way they won’t have any surprises down the road! If you lease or borrow someone else's horse always get their permission first before you teach the horse any tricks. I hope you have fun trick training your horse. There are so many fun tricks for you to teach your horse. Your friends and family will think you have the smartest horse around! Of course, you already knew he was!